Your home page(s) appears automatically every time you log on to the Internet on your laptop, so choose one or a few sites that you go to often for this setting. 1Open Desktop Internet Explorer and click the Tools icon in the upper right corner. Then choose Internet Options from the resulting menu. 2In the resulting Internet Options dialog box, on the General tab, enter a website address to use as your home page and then click OK. Note that you can enter several home pages that will appear on different tabs every time you open IE. Use Current: Sets whatever page is currently displayed in the browser window as your home page. Use Default: This setting sends you to the MSN web page. Use New Tab: If you’re a minimalist, this setting is for you. No web page displays; you just see the Frequent blank tab. 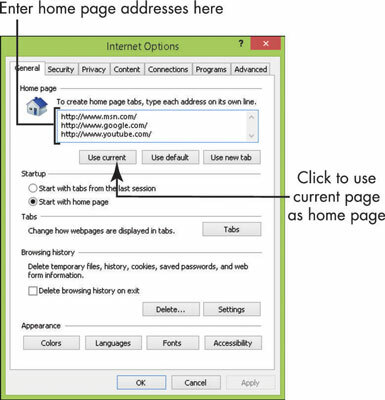 3Click the Home button on the IE toolbar (it looks like a little house) to go to your home page. If you want to have more than one home page, you can create multiple home-page tabs that appear onscreen when you click the Home button. Click the arrow on the Home button and choose Add or Change Home Page. In the Add or Change Home Page dialog box that appears, click the Add This web Page to Your Home Page Tabs radio button, and then click Yes. Display other sites and repeat this procedure to add all the home-page tabs you want. 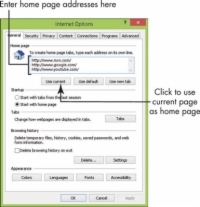 To remove one home page when you have set up multiple home pages, click the Home Page button, choose Remove, and then choose a particular home page or choose Remove All from the submenu that appears.